Governor Tom McCall and wife flew Audrey into Scappoose, Oregon on a helicopter on May 9, 1971 to take part in the dedication of the Peace Candle of the World, a structure shaped around a silo consisting of 45,000 pounds of candle wax shaped into a cylinder 50 feet tall and 18 feet in diameter (The Oregonian, 3-April-1971). With the aid of a cherry picker and a 60 foot long match, the Governor, Scappoose Mayor Forrest Sanders, and one Darrel Borck lit the candle during the Mother’s Day ceremony as the Scappoose High School band played America the Beautiful. Darrel Brock, the creator of the candle, operated a candle factory in a converted dairy barn in Scappoose. He intended the candle to be a symbol of the desire for world peace. 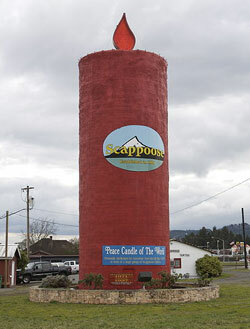 The “candle” still stands and is visible from U.S. Highway 30. Peace Candle photo by Wikimedia Commons user Cacophony, used under the Creative Commons Attribution 3.0 Unported license.